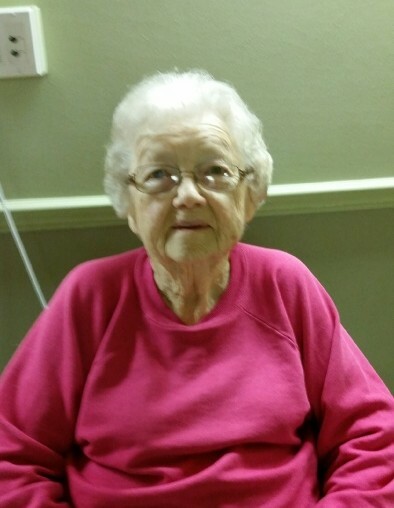 Betty J. Sunken, 92, of Wenona, died March 21, 2019 surrounded by her family in Illinois Valley Community Hospital. Private graveside services will be Sunday, March 31 in Wenona Cemetery with Rev Peter M. Glock officiating. The Hurst Funeral Home in Wenona is handling her arrangements. Betty was born in Wenona on September 3, 1926 to Adolph and Wanda (Milbrandt) Kline. She married James E. Sunken Jr. on August 25, 1951. She was a cook at Park Place and Blimpies for over 30 years. She also helped her husband on their farm. Betty enjoyed crocheting, making baby blankets for her grandchildren, and cruising the country roads. She loved spending time with her grandchildren. Betty is survived by one daughter Barbara (John Simmons) Lenhausen of Wenona, two sons; Jeffrey (Janet) Sunken of Wenona and Jimbo (Nancy) Sunken of Wenona, one daughter-in-law Laura Sunken of Wenona, thirteen grandchildren, twenty nine great-grandchildren, and her dog Sadie. She was preceded in death by her husband Jim, one son Gary “Cooper” Sunken, and eleven brothers and sisters.